What's New In Battlefield V? While the focus is still on class-based engagements in battles with large player counts, Battlefield V will incorporate several new features into the mix. In the trailer, we saw a squad of soldiers taking part in a large-scale fight in the French countryside. These particular characters had a unique look to them--one had blue face paint, and another female soldier had a prosthetic limb. This helped to showcase one of the bigger focuses in Battlefield V, which is squad customization. With the class system making a return, players will also be able to select a class and outfit that soldier--either male or female--with whatever tools, weapons, and cosmetic items they like. Furthermore, you can upgrade these classes to a particular specialization, such as the Assault class focusing more on anti-tank skills. Added to this is a greater level of detail and physics that are several steps above previous Battlefield titles. 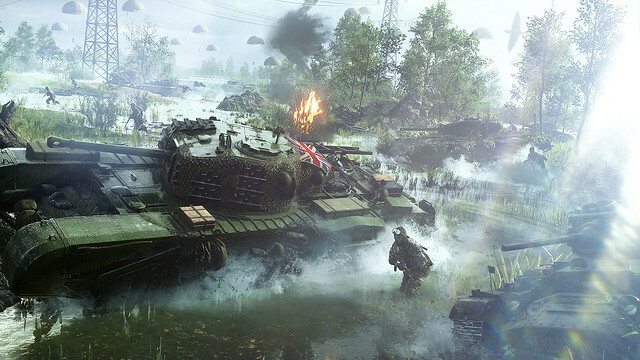 The developers stressed they wanted to add more elements of realism, while still retaining the fun and excitement found in the Battlefield series. For starters, the player and weapon animations and physics have been overhauled to offer a more tactical and kinetic feel. Soldiers now have a greater range of movement, which includes reverse-prone (on your back), sliding, shooting while sliding, and several other maneuvers--like grabbing nearby walls and gates. Moreover, weapons now have more weight behind them, allowing players to get more of a sense of the force behind each shot. The new animations also help with gameplay balancing, which was a recurring problem in Battlefield 1. Medics for instance will have to take more care with reviving players--even dragging wounded soldiers away if they have to--as doing so will take a bit more time when compared to the infamous "Medic-trains" of past games. Other gameplay tweaks include the removal of auto-spotting--pushing players to be more proactive with marking enemies and objectives--and offering more opportunities for players to regain resources from fallen enemies, such as ammo and explosive charges. In a surprising move--no doubt influenced by the initial reception from Star Wars: Battlefront II--Battlefield V will no longer have a season pass or Premium Edition, which were mainstays for most recent Battlefield games. Though players can spend real money on custom items for their characters, all in-game content and events--which includes maps, story missions, and game modes--will all be available through regular updates for all players. During the stream, the developers stated that the game will not be "pay to win." With that said, a Deluxe Edition will be available still, though the developers didn't elaborate further on its contents during the livestream. We will likely hear more about the specifics during E3 and in the months leading up to the game's launch. "The game will not be 'Pay to Win'" is a stupid phrase which should be made illegal to use because it is all but a lie. This is a distraction technique which should really read "given unlimited time you could slowly earn, over a very long and significant amount of time, everything in the game which is for sale through Microtransactions."